Nestle will just drill deeper and pump it all out, until there is nothing left, which is exactly what Nestle does all around the planet. California is facing one of its most severe droughts on record, which is hurting farmers and recreation alike. But despite water restrictions, Nestle is bottling spring water from the state and selling it, creating controversy alongside profits. Nestle owns Arrowhead Mountain Spring Water, which has been bottling water from a spring in Millard Canyon, Calif. for more than a decade. The company’s 383,000-square-foot bottling plant, which also packages purified water under the Nestle Pure Life brand, is located on the Morongo Band of Mission Indians reservation. In January, Gov. Jerry Brown (D-Calif.) declared a drought state of emergency in preparation for water shortages, especially during the summer months. The drought has entered its third year, and water restrictions have increased throughout the Golden State. But Nestle does not need to heed the emergency measures the state has adopted. Since its plant is on a Native American reservation – considered a sovereign nation by the US government – it is not required to comply with state regulations. The reservation is located in a Mojave Desert oasis at the base of the San Bernardino Mountains, 85 miles east of Los Angeles. Drawing water from that location, where just three inches of rain falls each year, prevents water from seeping downhill to fill aquifers of nearby towns struggling for water during the drought. Throughout 2009, Nestle submitted annual reports to local water districts detailing how much groundwater it was extracting from the Millard Canyon spring. But since then, neither the company nor the Morongo tribe has submitted those forms. Reports compiled by the San Gorgonio Pass Water Agency show that the amounts drawn from two wells in the canyon varied from a high of 1,366 acre-feet in 2002 to a low of 595 acre-feet in 2005, according to The Desert Sun. 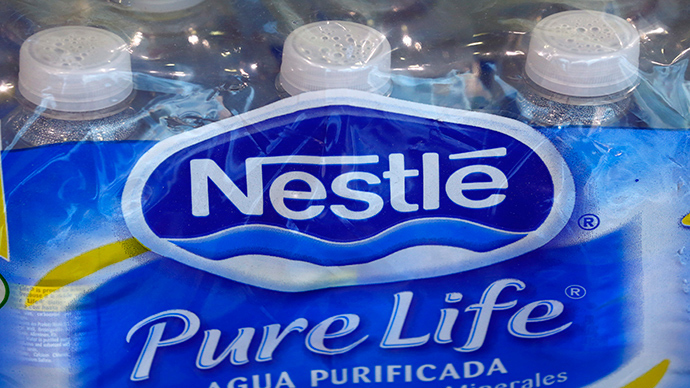 In 2009, Nestle submitted its last report, covering the water pumped from wells during 2008. The company said it pumped 757 acre-feet that year, but none of the reports were ever independently verified. The Morongo did file a report with California that said 598 acre-feet of groundwater was pumped in Millard Canyon in 2013, and three acre-feet were diverted. “Those amounts translate to about 200 million gallons a year — enough water for about 400 typical homes in the Coachella Valley,” The Desert Sun reported. Because of their sovereign status, the tribe has not disclosed water levels within the aquifer or the wells on the reservation’s land. Therefore, no one knows what impact the bottling plant has on water supplies. Gleick visited the Morongo bottling plant, located in Cabazon, while researching for his 2010 book ‘Bottled and Sold.’ He said that there was a small stream on the reservation, but that vegetation seemed to have died back due to a lack of water flow. He expressed concern with how dwindling water would affect the ecosystem in the oasis. If water weren’t being pumped and diverted from Millard Canyon for the bottling plant, that water would boost groundwater levels in the canyon and would gradually spread downhill into the Cabazon basin, Jeff Davis, general manager of the San Gorgonio Pass Water Agency, told the Sun. From there, it should flow into the Coachella Valley aquifer. But, because of that diversion, the water isn’t overflowing out of the Cabazon basin. In fact, the Cabazon Water District says the aquifer is in decline, with more water being pumped out than is flowing back in. The US Geological Survey database shows that some wells in the area have been sinking between one and four feet a year during the last decade. The community in the surrounding area is torn on what to do. Some argue that there is better use for water during the severe drought, which has no end in sight. Others point out that the bottling plant provides badly needed jobs. “That’s the highest, best use of water is drinking it,” Riverside County Supervisor Marion Ashley said to the Sun. “They’re entitled to use the groundwater basin, too. Everyone is. But it’s just a shame that this water is not being used locally. It’s being exported,” said David Luker, general manager of the Desert Water Agency (DWA). He told the Sun that DWA believes the Morongo should have to report its water use in accordance with state policies. Calvin Louie, the Cabazon Water District’s general manager, summed up the pros and cons of the bottling plant. Many fear that is the situation facing the Millard Valley, although the Morongo tribe denies that their water source is at risk. “The Morongo Band of Mission Indians is a sovereign nation with a long history of caring for the environment and of environmental stewardship as it relates to air quality, local habitats and tribal water resources,” Michael Fisher, a spokesman for the Morongo, wrote in an e-mailed statement.